We’d love your help. Let us know what’s wrong with this preview of The Scout's Backpacking Cookbook by Christine Conners. 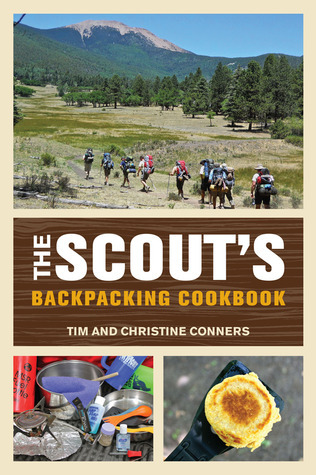 To ask other readers questions about The Scout's Backpacking Cookbook, please sign up. This is a great recipe book from people who are experts in the field, the Boy Scouts. You do not have to be a Scout though to enjoy these backpacking treats. There are some great unique meal suggestions for any meal of the day. Enjoy a selection of ethnic based choices Thai Peanut Shrimp or Jerky Spiced Rice. You can also enjoy a Thanksgiving dinner with chicken, stuffing, mashed potatoes and cranberries. We made this recipe for lunch in the backyard to test it out and it tasted great. We are lo This is a great recipe book from people who are experts in the field, the Boy Scouts. You do not have to be a Scout though to enjoy these backpacking treats. There are some great unique meal suggestions for any meal of the day. Enjoy a selection of ethnic based choices Thai Peanut Shrimp or Jerky Spiced Rice. You can also enjoy a Thanksgiving dinner with chicken, stuffing, mashed potatoes and cranberries. We made this recipe for lunch in the backyard to test it out and it tasted great. We are looking forward to testing more of these recipes and enjoying delicious food in the back country. The most outdoor activity I get is walking back and forth from the library and the occasional trip to the walking trail, but I love to cook and my sister is big into camping. I was just expecting stuff you can grill/fry over a campfire, but this really blew me away. I had no idea there was so much food you could dehydrate. Loved it!